This afternoon I picked up the farm share and, as my friend with whom I split it is away for a few days, I needed to deal with a larger portion of it. I also received some tomatoes, eggplant and celery from my mason. I do have a plan to can the tomatoes and celery and in the pressure canner but I didn't have enough time today. Instead, I made dilled carrots and beans and, when I ran out of those, one pint of dill cucumber pickles. All the vegetables were from today's share. 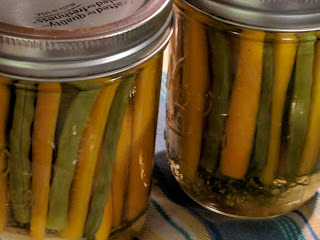 These, plus the cucumbers, were processed for 10 minutes and then they rested for 5 before I took them out of the canner. Also in the share: peppers, zucchini, eggplant, lettuce, beets, broccoli rabe, tomatillos, hot peppers, parsley, cilantro, dill, blackberries, cantaloupe, and tomatoes. I'm going to have to eat all the fruit before she comes back, but there is a lot for her to enjoy. These pickles won second place at the fair!